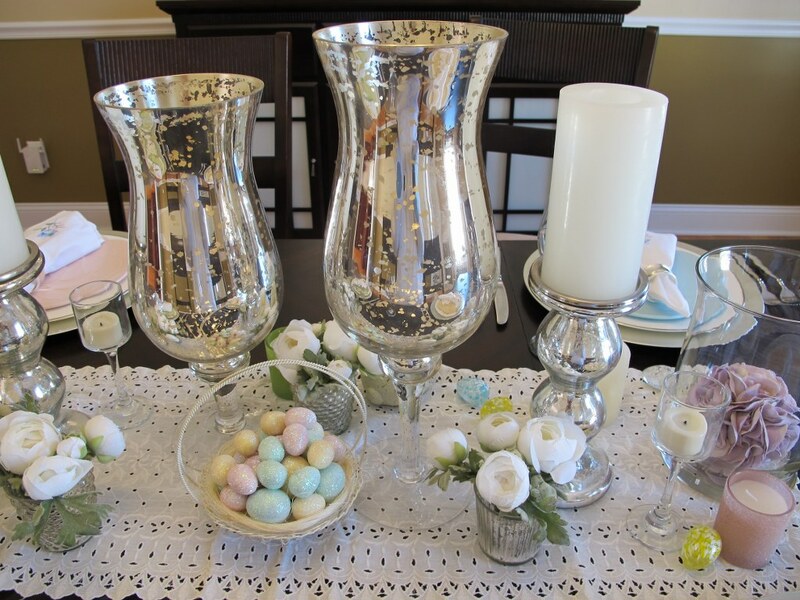 Time to set the table for Easter dinner! 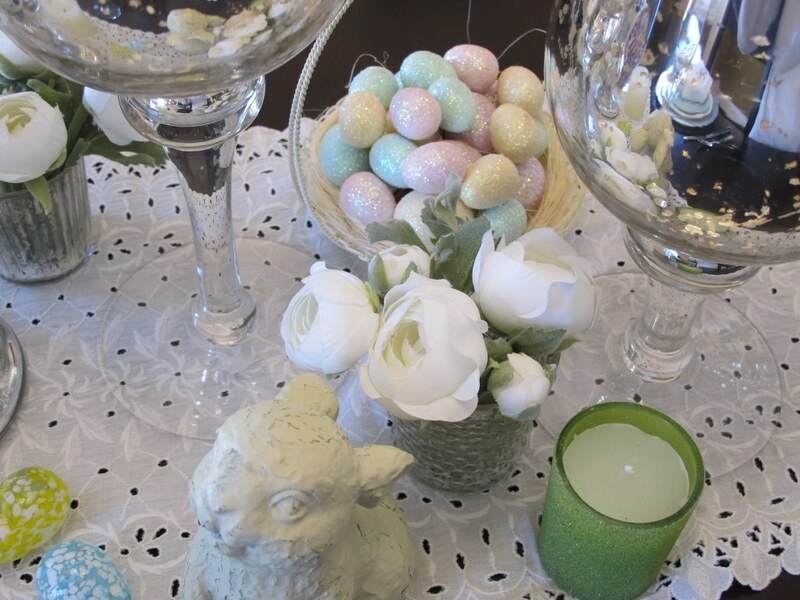 I don’t have a lot of Easter decorations so I tend to have more of a springtime table with accents of a bunny and Easter egg here and there. 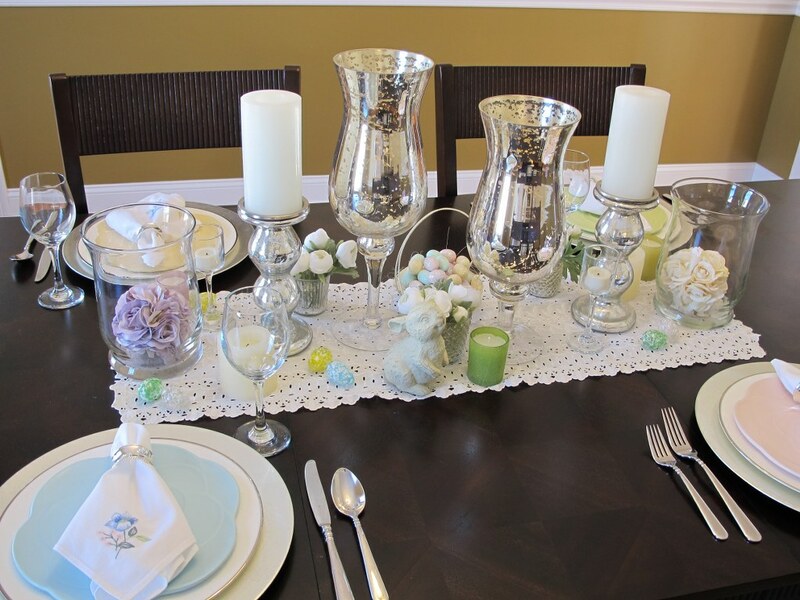 The delicate eyelet lace table runner creates a soft backdrop for my tablescape. Table runners can be a good tool to help you get a sense of where things can be placed on the table. I used a variety of hurricane glasses (mercury glass and clear glass) and tall chunky candles which run down the table. Using objects of different heights creates visual interest and appeals more to the eye. Of course I can’t leave out the Easter eggs and bunny! 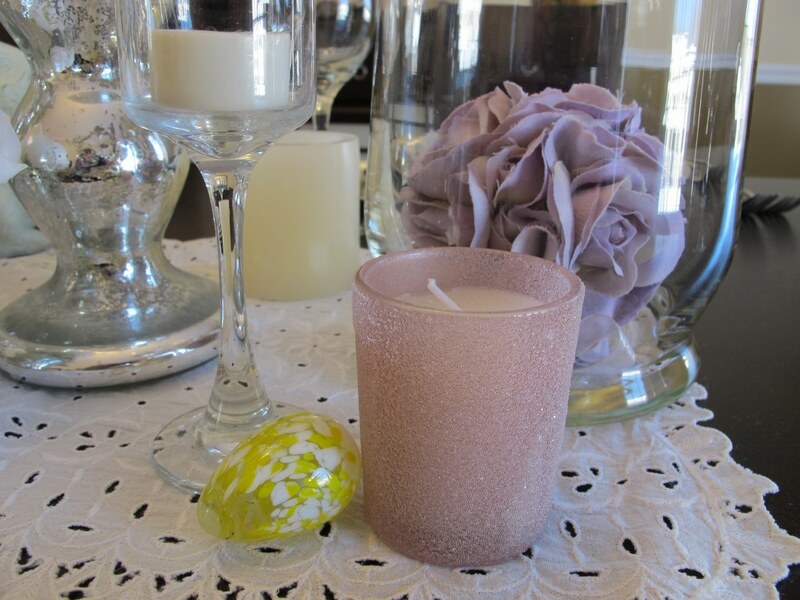 To continue my cheerful spring mix I placed simple groupings of little flowers in small mercury glass containers and pastel colored candle votives around the tablescape. Now for the table setting. I don’t use these flower embroidered napkins often so I’ve placed them on top of the table setting because I want them to be the focal point. 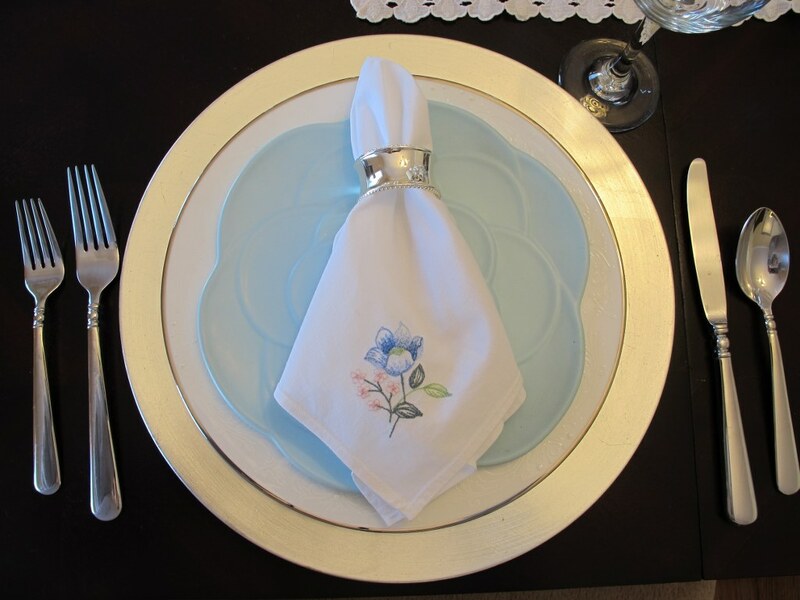 To add a touch of elegance I’ve used my formal white china dinner plates. They pair nicely with the pastel flower salad dishes (again sticking with the pastel color theme). I think charger plates are a must for a table setting because they add a hint of sophistication. I bought these silver charger plates at a craft store on clearance. Love a good sale! When it’s time for dinner I light the candles to set mood! Time to eat! 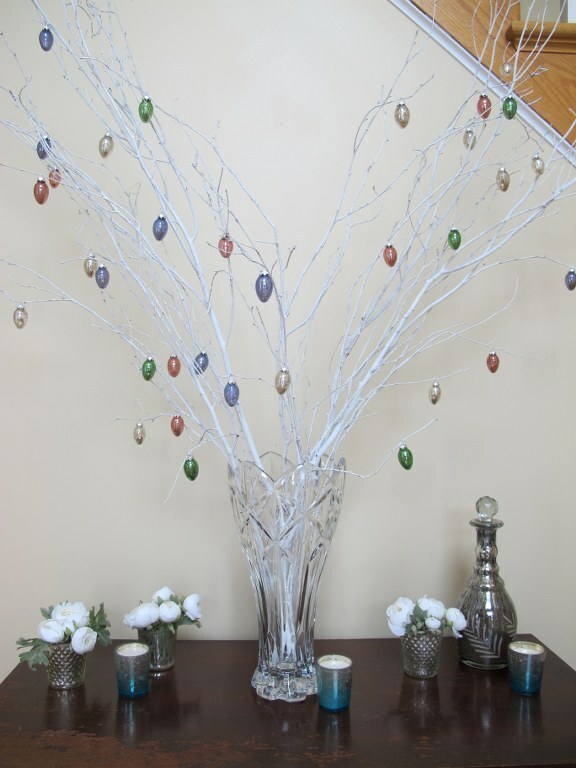 If you like these ideas then you might also like my Easter Foyer decor.